Photograph showing a detail of the moulding of temple No. 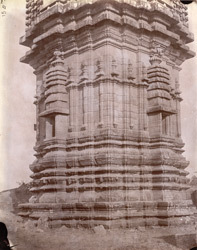 4 (Panchanana Temple), Barakar, Burdwan District, taken by Joseph David Beglar in 1872-73. In the report he wrote at that time Beglar said, "Temple No, 4 stands by itself. It, like Nos.1 and 2, consists at present of a single cell, but, unlike them, it does not appear to have ever had a mahamandapa in front, as the mouldings are carried round to the very entrance of the sanctum...The mouldings of the basement are...unadorned with sculptures...higher and bolder, and altogether more pleasing." J.D. Beglar, Report of a tour through the Bengal Provinces...in 1872-73 (A.S.I. vol. VIII, Calcutta, 1878), p. 152 The temple was built in the 16th century, imitating the design of the earlier Siddheshvara temple. The walls are decorated with friezes and depictions of animals.